Pip Waller lives and works in Llangollen, North Wales. She is a medical herbalist and massage therapist, in practice since 1988, and qualified in Plant Spirit Medicine with Eliot in 2005. She finds PSM so effective that it now comprises around 90% of her practice. 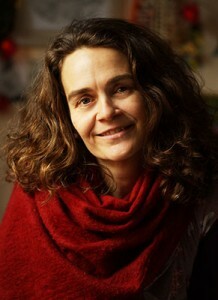 Pip has been teaching anatomy and physiology to students of holistic medicine for many years, and is the author of Holistic Anatomy: An Integrative Guide to the Human Body (2009 North Atlantic Books). Her second book is due out in the fall: The Herbal Handbook for Home & Health. Writing this book has got her even more seriously into making all kinds of stuff to do with plants. Pip loves singing, and walking and foraging in nature. She lives in an exceptionally beautiful part of North-east Wales with her ten year old son, her second husband and her very elderly father. The last couple of years she discovered Bhakti (devotional) Yoga and is now a devotee of Radha and Krishna.